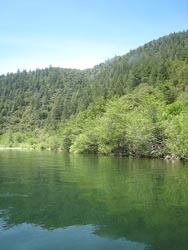 Sugar Pine Reservoir Area in the Tahoe National Forest is a good option for Middle Fork River rafters or kayakers who want to camp before heading to the river. Get more info by calling (877) 444-6777 or check out the campground details. You could also camp in Coloma or Lotus, about 40 minutes away from the Middle Fork Canyon. Try Camp Lotus or the American River Resort–both of which offer car camping, flush toilets, small camp stores and are right on the banks of the South Fork of the American River. A 2 or 3-day trip on the Middle Fork American is one of the best overnight rafting vacations in California. Fishing, relaxing on big sandy beaches, and enjoying time under a sky full of stars are just a few of the benefits of camping in the river canyon. There are plenty accommodations near the Middle Fork of the American River if camping isn’t quite your style. Chain places include the Holiday Inn in Auburn, (800) 814-8787 or the Best Western Golden Key (800) 201-0121. You can also stay in nearby Coloma (40 min drive) or even Placerville (1 hr 15 min drive). Try the Lotus Inn just off Hwy 49, on Lotus Road or the Bella Vista, just past Coloma. In Placerville, the Historic Cary House is located right on Main Street–the perfect stop off if you’re headed from a boating trip on the Middle Fork to the shores of South Lake Tahoe and taking Hwy 50.